Costa Rican food incorporates several staples of Latin American cuisine yet differentiates itself by being much healthier with the inclusion of an array of fresh fruits and vegetables. The quality of the following dishes when they are homemade is unbeatable, so try to get yourself invited over for lunch or dinner. Planning a Costa Rica trip? Then book this affordable G Adventures tour! Casado, or Comida Tipica, is the most common dish in Costa Rica. It consists of beans, rice with finely diced red bell peppers and onions, fried plantains, a cabbage salad with tomato and carrot, and a choice of meat between chicken, fish, pork, or steak with grilled onions. The meat that comes with a casado is grilled or sautéed, but never fried. Sometimes the casado includes french fries or extra vegetables such as avocados. Where to eat it: Everywhere! Casado can be found at any time of day or night in every restaurant and soda (Costa Rican diner) in any part of the country. If you are invited over to a Tico’s house for lunch or dinner, you can expect casado to be served. Yum! Ceviche is a popular boca (tapas or appetizer) consisting of fresh raw fish marinated in citrus juices such as lime with finely diced herbs and veggies. In Costa Rica, the best ceviche is made with local tilapia or corvina (white sea bass) and cilantro, garlic, hot pepper, onion, and celery. Where to eat it: Ceviche can be found in most restaurants and some sodas. If you are passing through Orotina on the way to the Pacific Coast, stop by the fresh fruit stands and try some green mango ceviche (the mango replaces the fish in this dish) – it’s scrumptious! 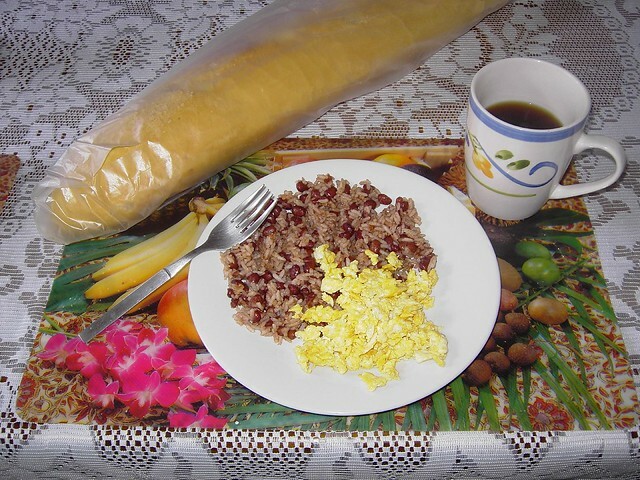 Gallo Pinto is the typical breakfast in Costa Rica. It consists of rice and beans mixed together (not separate like the casado), fried or scrambled eggs, chopped beef, fried plantains, and tortillas. A popular custom in Costa Rica is to pour Salsa Lizano over the gallo pinto. Salsa Lizano is a sweet greenish brown salsa with the faintest hint of spice. Where to eat it: Gallo Pinto can be found in any restaurant or soda, and although it is a breakfast food, it can be ordered at any time of day. Olla de Carne is a flavorful and nutrient-rich stew made with huge chunks of beef, potatoes, carrots, chayotes, plantains, yuccas, sweet potatoes, green plantains, and camotes. Where to eat it: At any typical Costa Rican restaurant or soda. Sopa de Mariscos is a tomato-based seafood soup with clams, mussels, shrimp, squid, fish, and vegetables. Where to eat it: Sopa de Mariscos is sold in most restaurants, but the best quality comes from the restaurants in Costa Rica’s Pacific coastal towns. Arroz con Camarones is a lot of rice with some shrimp mixed in. You can also order it as camarones con arroz, which is a lot of shrimp with a small serving of rice on the side. Where to eat it: Arroz con Camarones is best eaten in a restaurant in a beach town. Arroz con Mariscos is a lot of rice with some vegetables and seafood mixed in – clams, mussels, shrimp, squid, and fish. Where to eat it: Arroz con Mariscos is also best eaten in a restaurant on Costa Rica’s coast. Tamales are mouthwatering deliciousness! Costa Rican Tamales are boiled plantain leaves stuffed with corn meal mix, saffron rice, pork, and a variety of beans and vegetables. Where to eat it: Tamales can be found in the local farmer’s markets and sometimes in the grocery stores, but they taste best freshly homemade because they are customarily only made for special occasions such as Christmas or a wedding, which means a lot of love and time was put in to their making! Empanadas are fried or baked dough filled with cheese, beans, potatoes, or chicken. They are popular as a snack between classes or meals and are best eaten with a dollop of hot sauce. Where to eat it: Empanadas can be found everywhere: restaurants, sodas, and even random street vendors dedicated solely to selling empanadas. Chicharones are sinfully delicious chunks of juicy fried pork. Where to eat it: Chicharones are available at festivals. On a non-festival day, look for the Chicharones sign (usually with a crude drawing of a pig) outside of the local sodas because you can’t get these everywhere. Carnitas are beef pieces on a stick, grilled over an open hubcap-grill fire. Eat it by sliding a piece off between a tortilla. Where to eat it: Carnitas are a snack found at festivals. Just follow the yummy smell and look for the hubcap grills! Bizcochos are baked cheese and cornmeal dough rings. Where to eat it: You can buy bags of Bizcochos from the grocery store, but they are a much better quality if homemade or bought straight from a small Bizcocho factory. In most homes, Bizcochos are only made for special occasions such as Easter or Christmas, but some Ticos like to eat them daily with their mid-afternoon coffee. Pan = bread. Costa Ricans make a vast array of really delicious bread. It’s customary to eat a slice of bread with natilla (sour cream) while having your coffee break. Where to eat it: There are bakeries on every corner in Costa Rica. You can also expect to be served pan y natilla while drinking coffee in a Costa Rican home. Pejibaye is the Peach Palm fruit. It is thick and very fibrous and is prepared by boiling it in water that contains a meat, salt, and some stock veggies. You eat it by peeling it, slicing it like an apple, pitting it, and spreading mayonnaise on the slices. It has a meaty flavor, is rich in nutrients, and is an aphrodisiac. Where to eat it: Pejibayes are sold in supermarkets and ferias, but the best usually come from the roadside fruit stands. Pejibaye season is generally from October to April. The Caribbean side of Costa Rica has similar dishes, but the food is prepared differently with coconut milk, curry, and ginger. Rice and Beans is the Caribbean version of rice and beans cooked with coconut milk and spices and is the perfect accompaniment to Caribbean Chicken. Ron Dom is sopa de mariscos (seafood soup) prepared with coconut milk. Pan Bom is a dry chocolate bread cake. Patí are spicy beef empanadas. Where to eat it: Costa Rican Caribbean food is best eaten on the Caribbean coast of Costa Rica in towns such as Puerto Viejo. Costa Rica is synonymous with excellent coffee and Ticos drink it hot several times a day, even when it’s hot and humid outside. Where to drink it: Everywhere! Road side restaurants will serve coffee, although it’s likely to be an inferior brand to what you can buy yourself. In the local supermarkets, Volio or Café Britt are excellent brands to try. Souvenir shops will have at least one type brewed fresh for you to sip on while you shop (my favorite brand is Tres Generaciones). 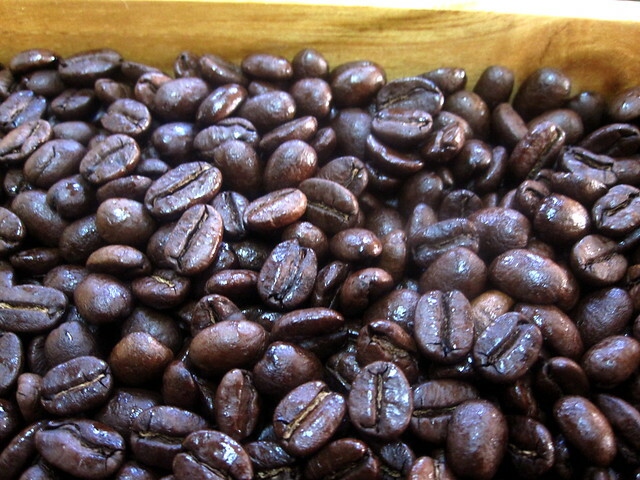 On a coffee tour you can try and buy the local farmer’s own brand of delicious rich coffee. Chan is a slightly sweet and slimy drink made from adding water to a few tablespoons of chan seed. The chan seed is small and has an aroma similar to lavender. When the water is added, the seed develops a slimy coating around them. You drink everything – swallowing the seeds whole. Chan is said to help with the digestive system, and lower fevers and blood pressure. I have benefitted from its calming effects on more than one occasion. Where to drink it: It is not very common in restaurants or sodas, but can be found in the common household. The seeds are also available for purchase at any of the numerous Macrobioticas (holistic health stores) or ferias (farmer’s markets) and it is easy enough to make yourself since all you have to do is add water! 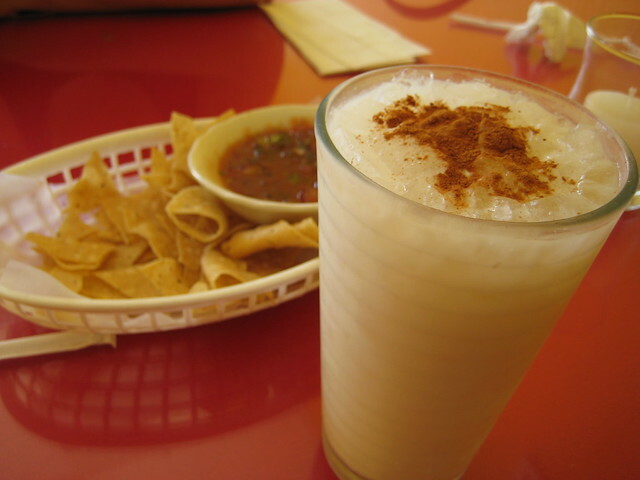 Horchata is a popular cold drink made from milk, rice flour, a lot of cinnamon, and sugar. Where to drink it: Horchata is widely available all over the country. Pipa fría is fresh chilled coconut water. It’s a perfect refreshment for a hot day – it is loaded with vitamins and gives you an instant burst of energy. Bonus – it’s an aphrodisiac. Where to drink it: Pipa fría is sold by vendors at high traffic intersections, on the beaches, and also sometimes in small roadside fruit and vegetable stands. It is sold in the coconut and also in a plastic bag, and is drunk through a straw. Where to drink it: Refrescos, or frescos, are widely available in all restaurants and sodas, including fast food restaurants. When perusing the menu, ask which of the refrescos are jugos naturales to ensure you are getting a freshly made beverage as opposed to one made from packaged pulp. Guaro is a popular clear liquor made from sugar cane. It has a sweet flavor and can be ordered as a shot or mixed with the same types of mixers typically used with vodka or rum. Where to drink it: Guaro can be found in all the bars and liquor stores in Costa Rica. The national brand is Cacique and is cheaper than vodka or rum. Ron Centenario is Costa Rica’s rum. There are a variety of ages and blends available. Drink it as a shot, on the rocks, or mixed. Where to drink it: Ron Centenario is available everywhere! 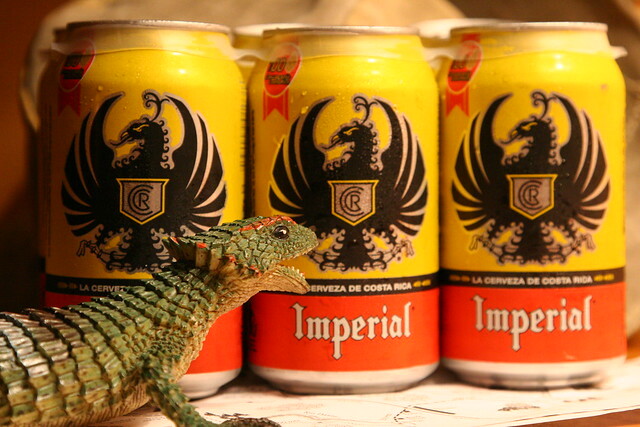 Costa Rica has two very popular cervezas (beers): Imperial and Pilsen. Imperial is an American-style pilsner with a taste similar to Budweiser and an awesome phoenix-like eagle logo. Pilsen is much lighter in body and taste than Imperial and perhaps it is popular for its water-like taste? Where to drink it: Everywhere. You can’t walk 20 feet without seeing an ad for Imperial. If you are on a budget and enjoy beer, you will be drinking Imperial or Pilsen because the high import taxes on other beers transfer into the costs for customers and definitely put a dent in the wallet.